The Elder Scrolls series is one that is very close to the heart of it's fans. People who have been around since Morrowing and beyond are almost fanatical about the games, and it seems like the more time goes by, the more the fanaticism seems to spread. So it wasn't surprising that when Skyrim was announced, millions of gamers stood at attention. Hype surrounding this game was astounding, and even now after the game has been released, the game is getting almost universal rave reviews. Personally I had never played an Elder Scrolls game before Skyrim, and my experience with Bethesda games in general was exceptionally small, though that's another story that I'll get into in a moment. At this point in time I have played Skyrim for about 40 hours, and I thought I would give my thoughts on the game, as someone who is new to the Elder Scrolls series. However before I start I want to point out that this is in no way a review of the game. I'm a strong proponent of the idea that a game cannot be properly reviewed until beaten. However that said, 40 hours is a significant chunk of time and I while I in no way claim it is indicative of the game on the whole, it's certainly enough to develop an opinon based on what I have seen. So with said, read on to read my impressions thus far! Before I begin in earnest, let me give you a quick concept of what the Elder Scrolls series is, and what my issue with these style games has been in the past. Games like Oblivion and Fallout 3 are known for being incredibly open world RPGs wherein you have a ridiculous amount of freedom as to how you want to play. The moment you are unleashed into the world you can immediately set aside the storyline and explore to your hearts content, and there are a million and one things to discover, people to talk to, quests to do, treasures to find, what have you. Now I am something of a completionist. I'm the type who purposely does everything I can before proceeding with the story. I explore everywhere, do every quest, talk to every NPC, etc. My issue with games like these historically has been that playing the way I normally would just isn't possible. When I played Fallout 3, the first time I stepped out of the vault I was immediately overwhelmed, and that feeling never really went away until I stopped playing about 6 hours in (which is another story entirely). Skyrim is much the same as these other games, however there haven't been very many occasions where I felt myself being overwhelmed by the content being thrown at me. Now a big reason for this discrepancy is quite possibly because I've changed how I approach open world games a little bit. 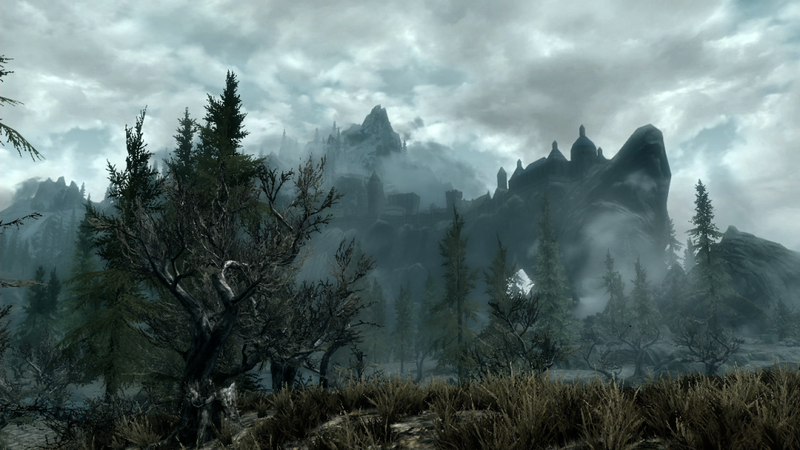 However the fact remains that Skyrim managed to make me feel interesting in exploring without overwhelming me too much. Between the time I was let loose on the world and the time I actually completed the quest to reach the first town, I had cleared 3 dungeons and spent 5 hours just exploring. You see, whenever you get near a landmark on the map, your compass will give you a little icon indicating which direction it goes. You can fast travel to any location you have previously visited, and so my desire to explore every location kicks in even more so than ever. Just walking around the map I constantly feel the desire to go check out what this new place is, and there are a ton of places to check out. Perhaps the most compelling thing is that almost every location also plays some part in a quest at some point in time, and so every location is carefully crafted to have some sort of story behind it. At this point in time I believe I have about 170 locations discovered, and there are still large stretches of land that I haven't even ventured near yet. Skyrim's ability to offer the vast exploration that previous games did, while still giving you enough direction to prevent that feeling of being overwhelmed is a major victory in my books. In reality they actually do this almost too well, since you will frequently get randomly generated quests to direct you towards locations you have yet to discover. I say "too well" because these quests can literally be generated infinitely. Eventually you will start getting quests for previously explored areas, but you aren't ever going to finish "every quest". So now that whole thing is out of the way, let's direct our attention instead at some of the more specific gameplay aspects. 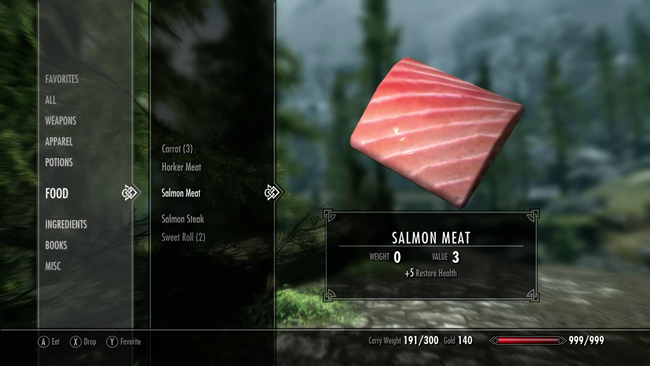 Frankly, this is where I feel the game is weakest, and it's a real shame, because it mars the whole process of experiencing this expansive and finely crafted world that is Skyrim. The game of course is a first person RPG. They have the option to play in third person, but I've never felt like third person was in any way better. If anything having your character on the screen just felt like you could see less of the world, which is bad in more ways than one. Now the problem with first person is that I feel like it doesn't really lead to having the best combat ever. You have a right hand, you have a left hand, and you have a button for doing whatever each hand is assigned to. It's incredibly simple, and melee combat in particular feels very weak to me. Magic and Archery feels much better, but this isn't particularly surprising in a first person game. Personally I have been playing my character as an archer, and there are some very satisfying moments as well as some very frustrating moments in this style of play. One of the things you can do is activate a sneak mode and attempt to avoid being detected by people. If you strike an enemy without being detected, you deal bonus damage. As an archer you have the advantage of not needing to be anywhere near your enemy to do this. As an archer I also have the ability to zoom in, and in so doing time slows down while zoomed. It's very satisfying to sneak around, stumble upon 3 bandits chatting to each other, and dropping them all without being seen. This is especially so because arrows have travel time, and so a lot of the time you have to aim to account for this. Hitting an enemy who is running about and seeing them fly across the room is very satisfying. However any time an enemy does notice you and is on top of you, I found to be very frustrating. Some enemies just seem to have significantly more resilience for no real discernible reason, and there is no real way to tell if you dealt a sliver of their health because they have lots of armor, because they have lots of health, or whatever other reasons. For that matter, you can't even see the enemie's name or health bar until the damage has already been dealt, and so when you stumble upon a gaggle of enemies, it's near impossible to discern which target is most dangerous. Now when an enemy does manage to start attacking, the result is dependant on what type of enemy it is. Enemy archers are easy to deal with since as an archer, i naturally have the upper hand (and hey, I can nab their arrows afterwards). Melee guys will just get up in your face and start tearing you apart. Sometimes. Once again, it's really hard to tell if an enemy will be dealing a sliver of your health, or drop you within 5 seconds, until you are actually getting hit. You can of course try and run while you get ready for another shot, but bad guys run just as fast as you, and in general there isn't much you can do once they are in your face. I end up either making sure they die before they get to me, or praying I can drop them before they slice me up. Mages on the other hand are probably the most annoying. They are the worst for being unpredictable since sometimes the same spell can do significantly different amounts of damage, and even with measly caster robes, some enemies just take forever to kill. Their spells manage to be ridiculously accurate every time, and whats probably one of the annoying things in the game, when you have magic in your face, your just completely unable to see anything but blue/red/purple. Let's take a step back for a moment now and talk about some more technical stuff. Sadly this is also an area where the game seems to stagger a bit. In more ways that one. You see, the interface for this game is terrible. Keep in mind that I have been playing on the Playstation 3, and the interface is clearly designed with consoles in mind. It looks kind of elegant, but the fact of the matter is the interface system in this game wastes a grotesque amount of screen space, requires way too many user actions to get to what you want, and is just all around an impediment to the gameplay. Similarly, this game is plagued with technical issues, which is not something that I at least, have seen very often on consoles. Loading screens are very long, and while you don't see them very often if you are just exploring the world or a dungeon, if you are exploring towns and shops, you see them quite a lot. Loading screens are a technical limitation and a necessity, but at the same time it's the responsibility of the dev to design their game so that you aren't forced to experience them so frequently, and I feel Bethesda didn't do a good job of this. Whats more, playing on the PS3 I have experienced severe lag at times, usually in town and/or after extended play. In general when I take a trip to town to empty my bags and do business, I spend about half my time waiting for lag or loading screens. There is also no easy way to save on consoles, you either have to *shudder* go into the menu and take upwards of a minute to go through the hard save process, or set the game to auto-save every 5 minutes, whenever you enter the menu. The lack of options become particularly apparent when you spend an hour exploring the map just to die and go back to your last auto-save. The icing on the cake is that I've run into at least one of what I would consider game breaking bugs - namely one of the primary questlines was completely cut off because a bug caused the next quest to not trigger. I know for a fact this issue is prevalent on all 3 formats of the game. In the end of the day, Skyrim is a very mixed bag for me. I'm glad to have hazarded a chance on it, because I have enjoyed my time, and always felt compelled to keep playing despite only having completed a couple of the main story quests by the 40 hour mark. The world is absolutely massive and incredibly well fleshed out. Every time I climb to the top of a mountain and look at all the areas I can and have explored I get chills. One time I even saw a dragon flying around a city half way across the world. I recognized the city, fast traveled there, and sure enough, there was the dragon. However just about everything in the game just feels like it's either mediocre or just gets in the way of the game experience. Sometimes even literally - I've yet to spend any significant amount of time travelling with a companion because they literally get in your way at an alarming frequency. From the combat to the interface to the loading screens to the bugs to the lag, the more I play the game the more I feel like there is just too much getting in the way, and I'm becoming incredibly frustrated with issues that just shouldn't be there. Is the game enjoyable? Yes. Will it be better in a year, when they have patched it and it's actually where it should have been at release? Probably. Will the PC version be significantly better once some mods fix Bethesda's brainfarts? Yes. Is this game worth a perfect score? Hell no. I would even say that maybe it just isn't my type of game, but it isn't the Elder Scrolls formula I dislike. I'm very much enjoying that aspect of things. Frankly, at this point I'm more excited about Kingdoms of Amalur than I am of playing more Skyrim. I will play more Skyrim, because I want to experience more of what this world has to offer me, but at this point I think I'm going to lay it to the side until I beat Skyward Sword, and hopefully the patch Bethesda has promised will make the game playable again.